Since 16-year-old Kimani Gray was shot and killed by two New York City Police Department officers as he left a birthday party at his best friend's house the night of March 9, the public outcry in the East Flatbush neighborhood of Brooklyn where he lived has showed no signs of slowing down, with nightly protests since March 11. On March 13 and 14, photographer Terrence Jennings captured these images of the aftermath of the teen's death. On March 14 Kimani's mother, Carol, told a room full of reporters, "He was slaughtered, and I want to know why." She also said: "I don't condone any riots, any looting, any shooting, anything against any police officers. Two police officers shot down Kimani, and I only want justice for two police officers to be off the street before they hurt another young kid." Meanwhile, the memorial to her son grows in his East Flatbush neighborhood. At a March 13 vigil, a large crowd gathered near the corner of East 55th Street and Church Avenue in Brooklyn and clashed with police officers in riot gear. Tensions were high on the evening of March 13. … and carried away by police on March 13. Some protesters were arrested for disorderly conduct, although it is not known for certain if this protester was among them. 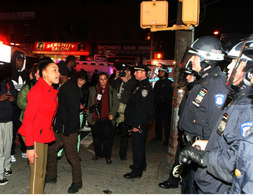 Members of the NYPD hold down a demonstrator. The community expressed its anger against law enforcement on March 13. Some observed the March 13 vigil with quiet reflection.